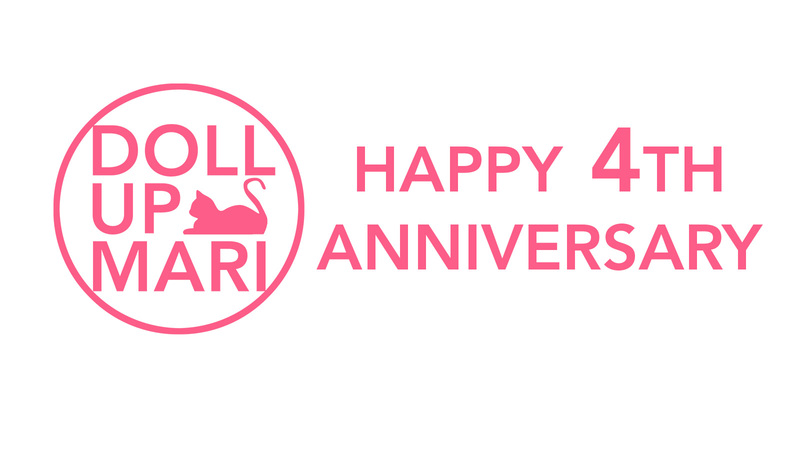 Happy 4th Anniversary, Doll Up Mari! Of course, blogging, like any other hobby, has its fair share of ups and downs and life lessons to learn from. I normally don't talk about things like this as you will always be bombarded with reviews and tutorials, but I felt like talking about things that go behind those reviews and tutorials. Here I go. 1.) Being grateful for everything I do. Throughout my whole life up until university, I have hated school. I hated my high school (which unfortunately was also my primary school and pre school) experience extremely. Most of my high school days were spent crying over the people, the happenings, and the stress. When I was in high school, the school was trying to be at par with more prestigious schools, so it was skipping a lot of "steps" and just raising the standards too high too fast that students like me were the one experiencing the wrath of it. I felt miserable over every single task that had to be done and I questioned the system every single day. I always wondered why we had to do everything that we were made to do. My stress levels had gone to the point that I no longer wanted to live. It was just that bad. I really just did everything to get through the day. Blogging got me out of that vicious cycle of loathing every single work related task I needed to do. Finding something that I wanted to do solely for just doing it gave me a new sense of direction in my life. And this constant yearning for satisfaction I always remember what veteran bloggers have advised me-- be grateful to have a backlog because it means you have content to write about. It means sponsors trust you that they send so much stuff that you can't talk about them all at the same time. 2.) Not having a comfort zone. I learned to value the value of doing all sorts of tasks because from there it's where you actually will learn and grow as a human being. In blogging, there is a need to balance theory and execution. Your ideas are only ideas until you actually execute them. When I started the blog, I had sub par photography, video editing, and PR skills. Now, I can say that they're still not of high standards, but they have come a long way from when I started. It takes guts to put yourself out there and know that you're making subpar content. I see plenty of bloggers who laugh at their old blog posts and collaterals, and being able to laugh at one's self is a generally admirable trait because it's often the ones too afraid to make mistakes who actually don't make it big. I see a lot of people who are very fit to be bloggers, beauty bloggers to be specific. I see a lot of people who are tech savvy, beautiful, and knowledgeable about beauty products. But the reason why they're not bloggers is because they do not want to go out of their comfort zone. They're fine uploading stuff privately and they are always scared of not being perfect, that's why they never try. I see a lot of people who write "beauty blog soon" on their IG profiles, and I honestly have no idea what is holding them back from getting on with it. Blogging is one of those things where you learn as you go, and until you start "going", you really will never start learning. But yeah, going back, I feel like this applies to a lot of things in real life. I honestly learned the value of trying things even if I know I will do horribly, even if I know people will laugh at me for it initially, or even into the future. Because it is from doing that we actually learn and grow. 3.) Having a work ethic. In the years I've been in this industry, the only "secret" that I've learned is having a work ethic. Being a popular or pretty blogger is not necessarily indicative of good work ethic. There are bloggers who are popular but have very horrible attitudes towards other people or brands. A good number of the very popular bloggers nowadays became famous too soon or became popular purely due to family connections, which is why they often do not have a sense of gratitude and professionalism over what they do. I have seen reaaal top dog bloggers and YouTubers who have behaved delinquently. In the long run, brands want to work with people who are reliable, sensitive over timelines, and ACTUALLY giving the brand the mileage in return for what it is doing. One's popularity doesn't matter in the end if one is not going to post about the brand at all. But I think it also deserves some clarification. Work ethic doesn't equate to being a sponsor's pawn. One can say no to brands one doesn't feel like working with or to events that are not value adding. Work ethic is pulling through agreements/promises when one actually does agree to work with a brand or attend an event. When one is angry, it's so easy to rant on Facebook. It's also tempting to do so! Having your friends have a blind item game for a few hours or days is fun right? PM-ing all the deets about the person you hate really gets the adrenaline pumping. Or getting a post against a person/brand/party viral feels like a victory right? I understand these feelings because I'm also just a human being. I also have plenty of acquaintances whom I think deserve to be in hell together. I also have been treated poorly while shopping, and I've also had my fair share of defective/scandalous products. But one thing blogging emphasizes is the impact of one's actions online to the whole picture. Yeah, it wouldn't be hard for me to get a post about a bad customer experience to go viral... But what would happen after? It would just snowball into fight after fight after fight. I will be picking a fight with the brand, who in turn will pick a fight with me, and all the other netizens who wish to get involved will also pick fights with me/the brand/among themselves. Who gains in the end? No one. Who gets emotionally drained? All parties involved. Chances are I won't get the resolution I need and the brand might even pursue charges. As such, when my customer interactions go awry, I try to get things resolved offline. If online, I try to resolve things privately. I understand that I am in a position of privilege that I know the key people managing a lot of brands so my queries may get preferential treatment, but I really try to resolve things privately. Another meaning to this is that when I see something that I don't have anything positive to say about, I just shut up. Being a blogger means putting up with a lot of negative opinions from people who don't even know you, and it's really unfair. People reaaaaally need to make you aware about every single thing that is wrong about you or your content. The anonymity that the internet provides has paved the way for content creators to see the worst in people. Being through such experiences makes one realize that it is not easy to be on the receiving end of online hate, and as such, one should not be part of the problem. I also have my own fiery views over politics, showbiz and country matters, but they never make it here or in my social media accounts because I do not wish to perpetuate a culture of hate. I try to focus on just posting about positive things. I honestly barely ever comment on news sites because it's too polarized that one really is bound to spur ill feelings. So yaaay, those are the things I wished to share. Happy anniversary to me!!! And to all of you who have been reading on since the start, happy reading anniversary to you all! happy 4th anniversary ate Mari! "I feel like this applies to a lot of things in real life. I honestly learned the value of trying things even if I know I will do horribly, even if I know people will laugh at me for it initially, or even into the future. Because it is from doing that we actually learn and grow." relate ako dito at humanga po ako sa sinabi mo na yan. May mga nakikita nga po akong hate comments pero I salute you kasi nahahndle nyo yung mga ganung bagay, at yung perspective nyo about it. Honestly hindi ko naman lahat nababasa ng blogs mo, kasi mas prefer ko yung nanonood(medyo tamad kasi ako magbasa) Tska mas lumalabas yung pagiging kalog mo kapag sa vlogs :) nga po pala, gagawa pa rin po ba kayo ng vlogs? Anw, thank you ate Mari for sharing your opinions, reviews, perceptions sa lahat ng bagay na na ishare muna sa vlogs mo :) at some point marami rin kaming natutunan from you :) Im happy for you ate Mari sana magkaroon ka pa ng maraming readers at magtagal pa ang blog mo :) Yey!! God bless you!! Congratulations and happy 4th Anniversary po Miss Mari. You're so blessed because you deserve it. Thanks for sharing us some beauty tips, techniques and even lessons in life. Stay humble as you are Miss Mari. God bless you always and wishing for more anniversaries to come. Love lots, one of your avid blog reader. Have been there. Not famous but had an issue online. Yung ang daming nangrarant sayo, tapos walang magtatanggol sayo ganon. Kung meron man bihira. The feeling na pinagtutulungan ka,it's heavy inside. Feeling mo wala kang magawa, wala kang kakampi. They will just judge you, judge and judge you. But im like you also. Nakeri yung mga problems na ganyan. Happy anniversary! Continue being successful and i know you will achieve more things pa po. You had always been helpful. All the things that you're posting po is really helpful. Marami po talaga kayong maaachive. God bless you po. Happy anniversary po ulit! Happy 4th Anniversary po madam mari sa Blog mo po! you've been thought us a lot of lessons in Beauty trends and lifestyles. I've been seeing you firsts in youtube po, then in fb, and the Blog of yours. I can see that you're very happy and Blessed sa mga ginagawa mo po, keep it up po madam! Andami mo pong fans kabilang nako, you're so Beautiful inside and out! Thank you so much for sharing a lot of tips and Blessings samin and Lots of love po! God Bless you more and more! Be Happy Always and reach more for your BIG BIG DREAMS! trueee dapat gusto mo talaga! we have tons of deadlines... kahit nung nag fifinals ako sa college kapag may compromiso ay lagare kung lagare para ma meet ang deadline. Happy Anniversary Ms. Mari! They may be struggles at the beginning but you have triumphantly overcome it. They may be mistakes and failures but you have made it a learning experience. You've become a wiser, stronger and hard working person that is why you have come this far. So I wish you more success and power on your career. Congratulations and Happy 4th Anniversary!!! Hoping to see you more years blogging. Thanks for sharing your thoughts with us. Tatatak sa aming isipan ang magandang mga bagay na nakasaad dito sa blog mo na ito. Lalo sa mga umaasa o may gusto na maging blogger na katulad mo.